Hi everyone, and welcome to my very first blog post! Today we’re talking about mindfulness for kids. Specifically, what it is, and how you can teach it to them. Because, well, this website is called “Mindful Little Minds” after all. And while mindfulness is not the only thing we’ll be focusing on here, it’s certainly a great place to start! I feel like mindfulness is a bit of a buzz word at the moment. Especially mindfulness for kids. And while it seems to have popped up everywhere in the last few years, it’s something that has actually been around for thousands of years, often as part of religious and cultural practices. Psychologists have been talking about – and practicing – mindfulness for many years too. I first learned about mindfulness back when I was a very new intern psychologist doing a work placement at a private hospital in Sydney. I remember thinking that it was hard! Hard to explain and hard to do! I’d never heard of anything like it or done anything like it before. Fast forward 13-ish years, and I’m seeing mindfulness for kids everywhere! And for good reason. 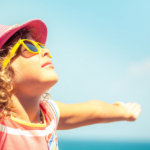 Countless studies have shown that children who practice mindfulness have, amongst other things: increased self esteem, lower rates of anxiety and depression, greater resilience, better sleep, and improved classroom learning. However, I think there might be a bit of misunderstanding out there about what exactly mindfulness is. I know I often find myself getting a little frustrated at hearing things being described as mindfulness exercises when they’re really not! It’s not emptying your mind, stopping yourself from thinking, distracting yourself from negative thoughts, or thinking positively. And, while it can be relaxing and can sometimes help us calm down, it is not necessarily either of these things either. In fact, depending on the type of mindfulness activity you’re engaged in, and how you’re feeling at the time, it could be the exact opposite of relaxing. Being mindful of how we’re feeling can sometimes be quite uncomfortable. Ok, but what does that actually mean? Well, have you ever been driving in your car, then arrived at your destination with no recollection of actually getting there? Or not realised one of the kids was talking to you until you heard a very annoyed, “Muuuum, are you even listening?!”. Have you ever been sitting at a school assembly, wondering what to cook for dinner and then suddenly realised you have no idea why people are clapping? Me too! And those are all great examples of NOT paying purposeful attention! Often, when we’re engaged in an activity, we’re not truly engaged in it. Instead, we are lost in our thoughts. We’re wondering what we’ll cook for dinner, whether we signed that permission slip, or when we last rang our mum/sister/best friend/hairdresser. And, most importantly, we don’t notice that we are absorbed in our thoughts, until something snaps us out of them. Like a whining child. Or a car horn. Or a clapping audience. Mindfulness is about noticing that your mind has wandered off in those moments, and then bringing it back to the present. The goal is not for your mind to never wander. This is what minds do. In fact, it is what they’re meant to do. The mindfulness is in the noticing. If you notice that your mind has wandered, then you’ve been mindful. Congratulations! I know what you’re thinking. You’re busy and you don’t have time to sit around meditating. The good news is that you don’t have to (although you certainly can if you want to!). Let’s use an example to demonstrate how a busy mum can incorporate mindfulness into her day. Here’s one I’m sure most of us have first hand experience of: it’s 3 minutes until you need to leave the house, and one of your children is shoe-less. 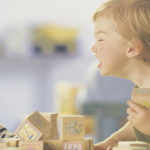 I know in my house, there’s frequent yelling about shoes – and often one missing! Yeah, just one. Here is a mindful response to this situation. First, I notice the shoe-less child. I feel irritated, or maybe angry. Instead of immediately reacting to those feelings (i.e. yelling at my child), I simply notice them. I notice that my jaw is tense, and that my heart is beginning to beat faster. I notice my thoughts. Maybe I’m wondering why this happens most mornings, or I’m worrying about being late. Again. Then, I’m going to acknowledge that these thoughts and feelings are there. I’m feeling annoyed. In that moment of noticing, I have given myself space. Space to take a breath, recognise that I’m experiencing annoyance, and respond, rather than react to the situation. I’ve not been triggered by my desire to get rid of this “bad” feeling, because I haven’t labelled it as such. I haven’t been judgemental. The ultimate goal of mindfulness, is to accept our experiences as they are, without judging them as “good” or “bad”. We often label our thoughts and feelings like this. Mindfulness helps us to be aware of these thoughts and feelings, without assigning labels to them. Thoughts and feelings are not good, or bad, they simply “are”. They come, and they go, and they do not have any power over us once we are able to accept this. When we are simply aware of their presence, and notice this coming and going, then we can choose how to respond to them. And that is the goal – to reach a place where we can respond to challenges thoughtfully, instead of reacting to them mindlessly. It takes practice. Lots of practice. I am sitting here, 13 years after I first heard of mindfulness, still practicing. But it does get easier, I promise. Don’t give up! How do I teach mindfulness to my child? But how do I teach this difficult thing to my child, I hear you ask?! Well, that part is actually not as hard as you think! Children are already much more mindful than us adults. They’re not trying to multi task. They’re not juggling the demands of running a household, or maintaining a job. And when they complete an activity, they often become engrossed in it. Have you ever watched a child colour in? They do it with everything they’ve got! Nevertheless, here are a few tips for introducing mindfulness to your child. First of all, the most important thing we know about children, is that they learn by watching us. Practice mindfulness yourself, and invite your child to join you. Keep your language simple. Talk to them about noticing. Ask them to notice feelings in their body, as well as what they can see, hear or touch around them. Don’t force them to join in if they don’t want to – mindfulness is not a punishment or a chore. If they decide not to join you, let it be a lesson in mindfulness for you, and accept the situation as it is! Keep mindfulness activities nice and short. Just a minute or two is enough for a young child. To start with, you may like to try breathing exercises with your child. These can be a simple way to provide a focal point for our attention. Many of us breathe quite shallowly, into our chests. This results in quite rapid breathing that can leave us feeling tired or anxious. When we breathe mindfully, we breath deeply and slowly in through our nose, filling up the belly (just like a balloon!). We then exhale, slowly and steadily, releasing all the air from our lungs, so that our belly becomes small again (like a deflated balloon!). Finally, when you’re practising mindfulness with your child, keep it fun! 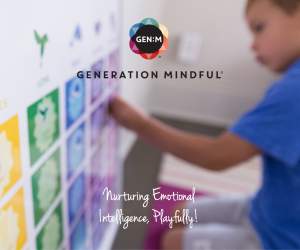 Children do not need to sit still to be mindful. Practice running, jumping, walking, or skipping mindfully! 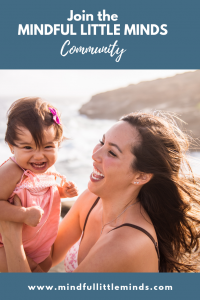 If you make mindfulness a fun part of your everyday routine, you and your child will be reaping the benefits in no time! 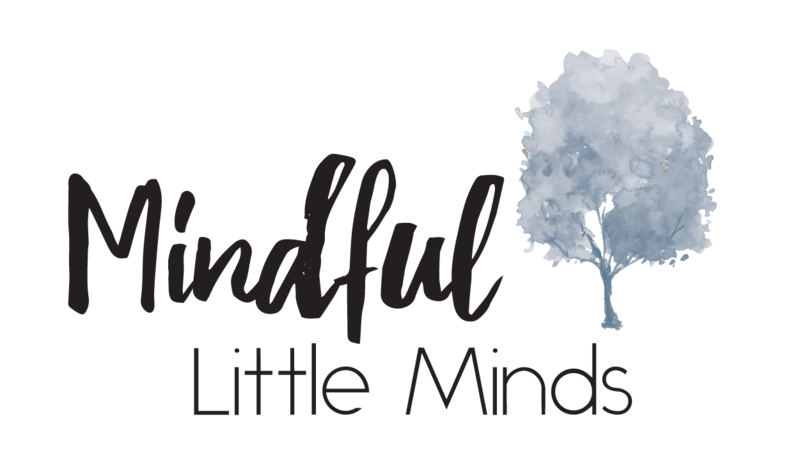 I hope this helps you to get started on your mindfulness journey with your child! I’m so excited that I get to be a part of it! I’d love to hear how you go – feel free to get in touch with any questions or feedback!